Have you ever wanted a mom friend that really got you? Someone who didn’t judge that your kids ate hot dogs for two meals in a row or that you always wear yoga pants but never do yoga? Someone you never had to clean up for before a play date and who would hold your baby long enough for you to take a crap? Meet Jennifer Weedon Palazzo and Dina Drew Duva, the mamas behind MomCave! They, along with some very funny and creative friends, produce comedic videos for moms and host a thriving online community, including weekly live interactive videos on Facebook. With the proliferation of mommy blogs and Pinterest-fever, moms can often feel that they’re coming up short. Being a mom is hard. Jen and Dina use comedy to deal with the struggles and celebrate the victories. Jen and Dina will be assisting with “Just Improvise” during Friday’s schedule of activities. MomCave’s videos (Slacker Mom, Slummy Mummy, and more) have been honored in film festivals and awards shows. 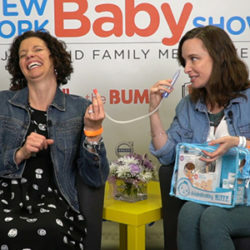 Their live show, MomCave LIVE, was nominated for an IAWTV (International Academy of Web TV) Award for Best Live Series. Jen and and Dina were nominated for Best Comedic Duo for the Whohaha Female Comedy Awards and were selected for YouTube and Whohaha’s Women in Comedy Initiative. Their “Married Mom’s Message to Single Moms” went viral worldwide, with coverage in US Weekly, Global News and more.